If you ever get the chance, you have to make the drive up the Alcan! My first trip up was in 2003, when two friends and I set up a moose hunt about 30 miles north of Tok, AK in the 40 Mile area. My oldest son was stationed at Fort Richardson with his small family, and they were expecting a third child during the time my wife and I were up there. I hit the road at 4 am on a Friday morning, drove up I-15 from my home in SE Idaho, through Great Falls, one of my old stomping grounds, then on up through Calgary, Edmonton, and finally putting tires on the Alcan at Dawson Creek. Odometer said right at 2,700 miles traveled when I parked in front of the son's base housing unit on the following Monday morning. BTW, I made the trip up on the first of September, and by that time of the year, didn't suffer the frost heaves that can make the trip an abusive, excruciating drive earlier in the year. While there, the wife and I, and the son's family also drove down to Seward for lunch, and back to Anch for a great 'day trip', but we didn't get a chance on that trip to make it the rest of the way around the Kenai Penninsula to Homer, nor down to Valdez. Another trip, perhaps after the wife retires, and we can meander around and take our time doing what we want to without a compressed time schedule. Besides, I want to finally do some salt water fishing, and perhaps tie into a 'barn door'. I do love Halibut and Salmon!! I took the time to prepare the 'Burb by replacing anything, and everything that I could imagine might be worn or questionable. It paid off! I took along a full set of tools, two spare tires, u joints, bearings, well, pretty much what you'd prepare for any extended 'way-back-country' expedition. Pay for everything in Canada with a credit or debit card, and let the bank worry about the exchange rate. The locals I ran into along the way weren't really entertained when having to calculate the exchange rate between US and Canadian currency. I only took $200 cash through Canada, and stopped in Great Falls at a bank, and exchanged it there for Canadian currency. I spent the last two dollars on a bag of chips before we re-entered Montana on the way home. Oh, for those who might not have had the experience of engaging some of the Kanuks before, there's some things you absolutely must know. Do NOT ask who the ugly lady with the crown is in the photograph above the counter when you check in at the Canadian Customs! Especially not at 3 am!!! Do NOT try to keep pace with a Canadian when drinking! EVER! You will never learn the correct way to enunciate 'Canadian speak', so don't try to come off sounding like the boys in "The Great White North", eh? The Mounties WILL be behind a tree, no matter where along the way, if you try to go a couple of miles over the speed limit. (Remember to adjust you speedometer, or change your GPS to read kilometers per hour!) Also, they have NO humor for 'foreigners' trying to explain their way out of a ticket. There is no "seven miles an hour over the speed limit" rule up there, except on the major highways between and around Calgary and Edmonton, where your outfit had better be able to do the quarter in about twelve seconds, and be able to get to and maintain somewhere around 85 mph. Best comparison I know of is trying to merge into traffic around Dallas/Ft Worth, or Oklahoma City on I-40 or the business loop around OKC. ALL females northwest of Edmonton are absolutely gorgeous! Even if they have no teeth and weigh upward of 300 pounds or more. Also, they ALL have a huge, hulking male attached to them that will jealously protect them. The only thing that they value more than a woman is their sled dogs! Also, it is impossible for a mere American to come out ahead in a drunken altercation with a backwoods Kanuck! Do not try it. The speed limits are posted in kilometers per hour, you purchase gas and diesel by the liter, AND northwest of Dawson Creek, fuel up every chance you get, as it can be a VERY long walk or wait for help. Cell phone service, at least by 2005, my last trip, is spotty at best. Get the little card from your insurance company that specifically states that you are covered in Canada!!! Do it! Don't try to sneak or take a handgun of any sort through. The RCMP has absolutely NO humor. If in doubt, find someone in Alaska who has an FFL, and ship your guns up prior to traveling, pick them up there, and ship them home. I just have to ask, you really didnt ask who the ugly lady in the crown is, did you? I go to Ontario, Nova Scotia, and Kingston quite a bit, and have seen how the authorities can be, even when you are joking about the queen. I swear some Canadians have no sense of humor, ever. As for keeping up with a drunk Canadian, it helps if you are Irish, like my wife is, anyone else will miserably fail. And, your comments about not going over the speed limit, and making sure you pay attention to the speed, i can also attest to the fact that that isnt just the west side of Canada. i was doing 102 KMH outside Kingston, where the speed limit is 100 KMH, and got a ticket. Also, tickets in Canada are usually a couple times more what they are in the states, and can be a hassle to pay through the mail, at least around Ontario and kingston. Oh, and lastly, unless you have serious fighting skills, like he said, dont pick on hockey, even a little bit, EVER. Great post, Rocket Doctor!...My only trip to Alaska so far was in 1975. I was working at construction in Carson City, Nevada, and given a moment's notice offer to make the drive. My good friend, Bob "Bearclaws" Stuttsman, was the impetus for that trip. (I shared details about Bearclaws at the forum: http://forums.4wdmechanix.com/topic/149-outdoor-friends-family-and-mentors/?p=485.) Bob was as colorful as the trip itself! We drove from Carson City straight up U.S. 395 to Colville, Washington and crossed the border at the base of the Okanagan Valley. Bob couldn't stop talking about U.S. gun laws as he "allowed" Canadian Customs to secure a customs string and seal around the metal tackle box that housed his two .44 Ruger single action pistols. Canadian Customs could easily have told us to make a U-turn with the '66 I-H Travelall 4WD and our small travel trailer in tow. Instead, the tolerant official simply said, "We understand your gun laws, but this is Canada...This seal must be in place when you exit Canada at the Alaska Frontier...Here's the accompanying paperwork, Mr. Stuttsman." In those years, you could transport pistols in a customs sealed container. We each had long rifles that were declared at Customs, and there was no concern about hunting rifles. Bob had his Model '86 Winchester 45-90, I toted my 1908 vintage Winchester nickel-steel octagon barrel .30 caliber, each were traditional lever action rifles. The Fraser River, Fort St. John, Ft. Nelson and Whitehorse were each memorable. Along the Alaska Highway, a stop at the Liard River Provincial Park is a must. (Here's a quick Wiki overview: http://en.wikipedia.org/wiki/Liard_River_Hot_Springs_Provincial_Park.) After days of dirt travel (1100 miles were still dirt in 1975, this is Milepost 497), the public hot springs make a welcome break. Moose, wolves and bears are plentiful in that area. I took photos on that trip. In our living room are framed prints of photos taken alongside the Liard River at sunset and near Tok Junction, our entry point into Alaska. The prints have weathered nearly forty years of shuffling from home moves. The camera was my bulky Mamiya-Sekor C330 twin reflex 2-1/4" square format. 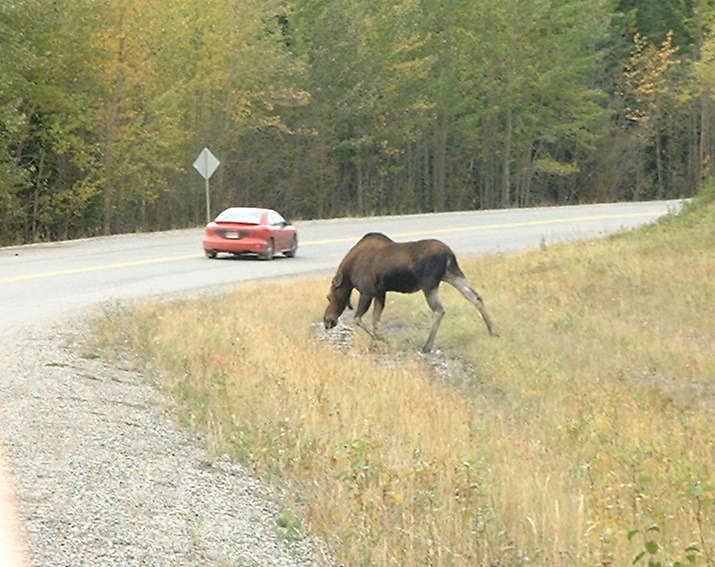 Rocket Doctor, you'd enjoy the photo of a moose cow in a marsh near Tok Junction. Bob and I headed through the Matanuska Valley and past Fort Richardson en route to Anchorage and the Kenai Peninsula. Bob's Cousin Ned lived at Soldatna, he had homesteaded there with his brother in 1959. A failed potato crop drove Ned into a job with the local school district. We spent time on the Kenai and drove out to the spit at Homer, where I took photos of the King crab catch at the local docks. My trip back to Carson City and an apprenticeship with Local 3 of the Operating Engineers began with a puddle jumper air flight over the Cook Inlet to Anchorage...I flew from Anchorage through Seattle to Reno with reflections of Alaska the entire way. Bob stayed on at Ned's place for a bit, scouting out the Kenai as a possible move from Nevada. I would enjoy another Alaska trip. This time, I'd make a right turn at Tok Junction and head for Denali and Fairbanks. Maybe on a dual-sport motorcycle, though I'd avoid overnight tent camping in bear country! It's one thing to sleep in a tin trailer with two rifles close at hand, another to sleep just a nylon tent wall from a grizzly! I tried to post some of the photos of our trip, but the files are huge, and, not being a "digital whiz kid", I'm still struggling with how to re-size the things to get them to post! 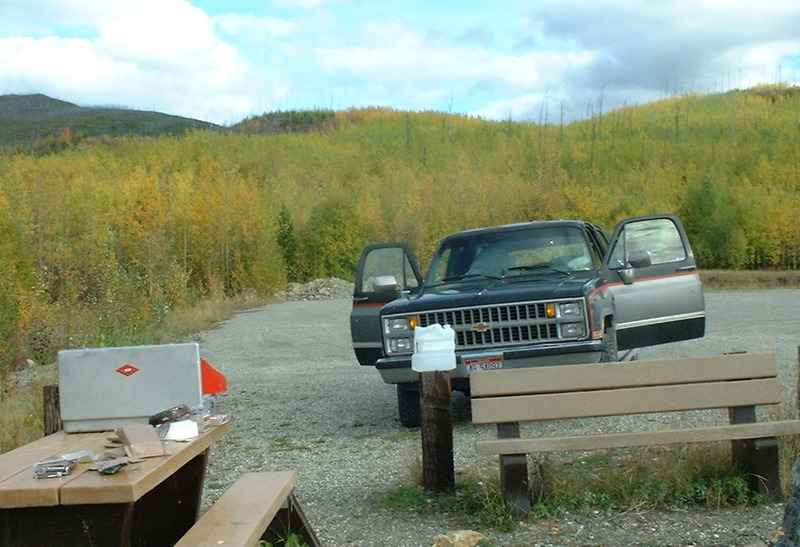 Stopped for lunch 'somewhere' along the Alcan, prior to getting to Whitehorse. At this point, I actually got the stove out, made a pot of coffee, filled the thermos, cooked up some soup, a bit of bacon, a couple of spuds and an egg, and feasted. It proved to be too much, and the extreme lack of rest areas (at least like we're accustomed to along our Interstate Highway System) do NOT exist once on the Alcan. 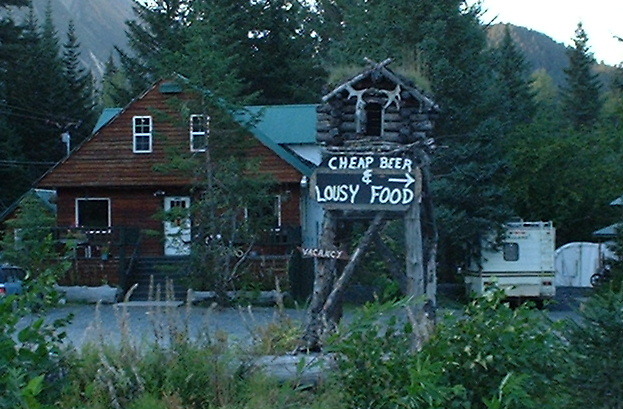 This sign gives a glimmer of Alaskan humor. Just after the turnoff to head into Exit Glacier, outside of Seward, AK. 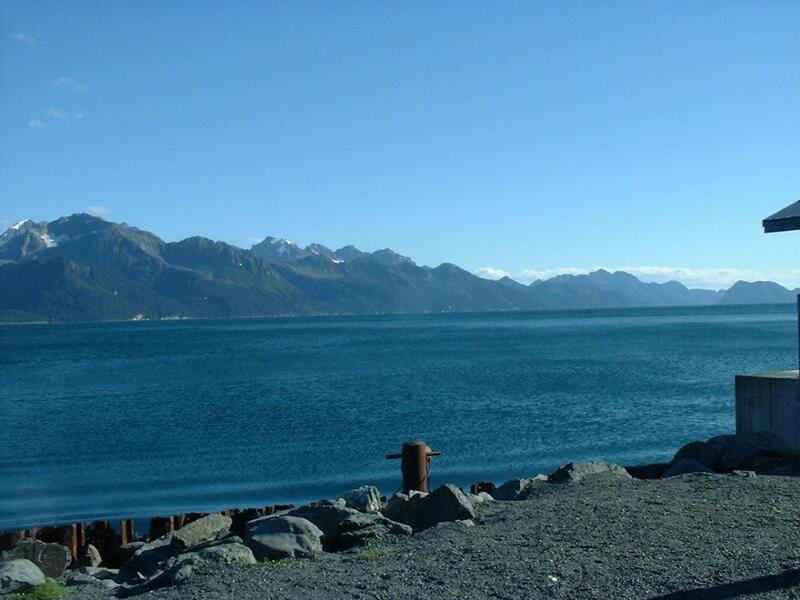 Destruction Bay, north of Haines Junction. It was clear, with a frigid wind blowing directly off the water into my face as I took this shot, and it is the last shot I was able to take with my camera for several days. Not sure what happened, but the camera did NOT like the cold, and I was unable to use it after we flew into the hunt area. 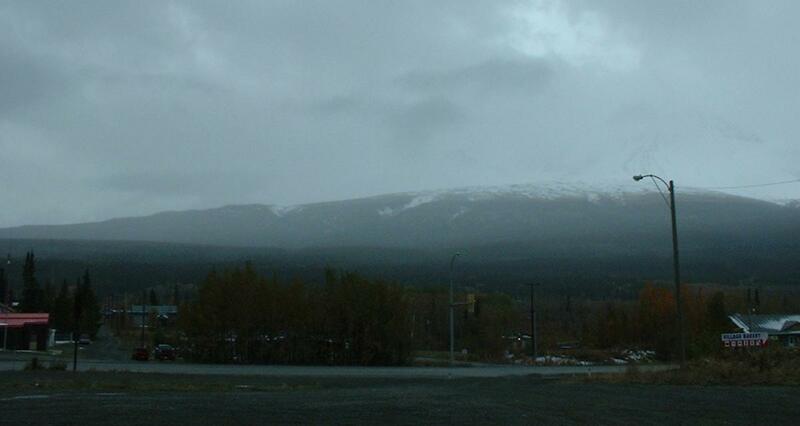 This shot is looking toward Haines Junction, coming in from Whitehorse. On this trip, this is as bad as the weather got. On the trip out....well, it was a bit more challenging between here and Edmonton! As you pull into Tok, AK, you have several choices. Turn left and continue on for 350+ miles to head into Anchorage. Stay on the road to Delta Junction, turn left and go down to Anchorage. Stay on the highway, go through Delta Jct and head on into Fairbanks......but if you came in non-stop from Haines Jct, this place might be the more prudent option, at least overnight. Fast Eddie's had good grub, clean, quiet rooms, nice staff, and was a welcome respite from the road. This pose is mandatory for a trip on the Alcan! Gotta get one foot in Canada, and one in the US, of course! The official "end" or "start" of the Alcan, depending on which way you're headed. 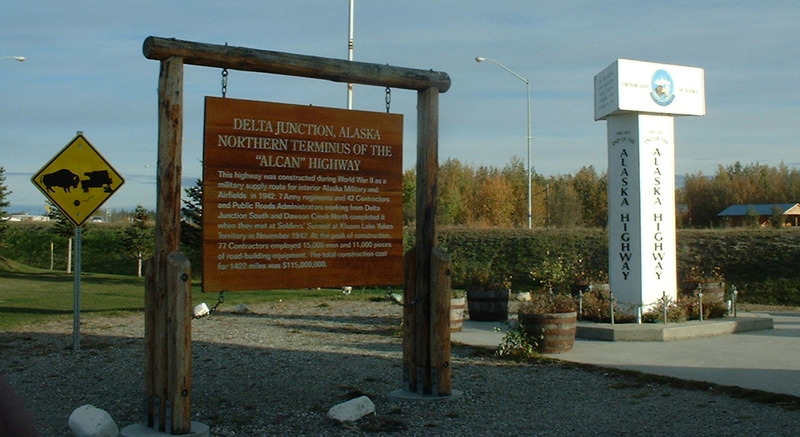 Delta Junction. You will see these, as well as caribou, black and grizzly bears, and real, live free-ranging bison along the entire route, any time of day, 24-7/365! BEWARE and be alert. You do NOT want one of these coming through the windshield, and are the reason you see a lot of trucks up there with 4", schedule 40 pipe 'critter gitters' and 'sliders' that are an attempt at deflecting animals away from the windshield. Also on display at Delta Jct. 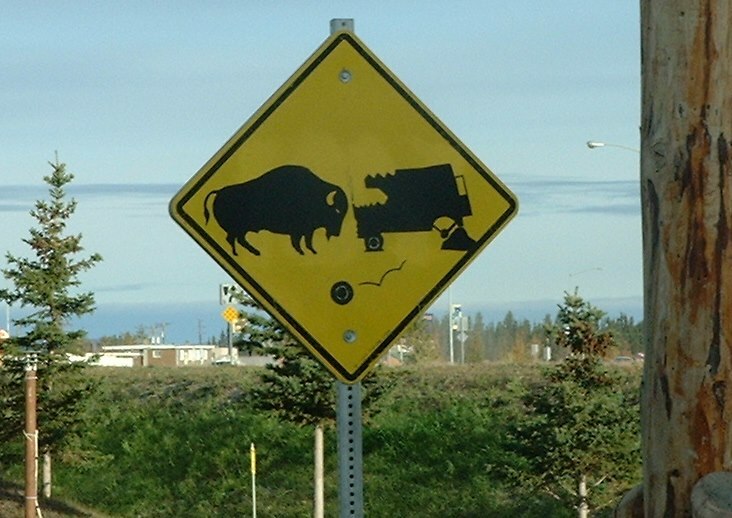 Not sure that AK highway department installed it, or a local attempt at humor, but the warning about hitting a bison, and having yer outfit destroyed, and the buff wandering off unhurt is valid! This is the view we got on the day trip from Anchorage to Seward! Mighty purty! There's also an outstanding aquarium there with a lot of the sea critters that inhabit both the sea, and the fresh waters there. 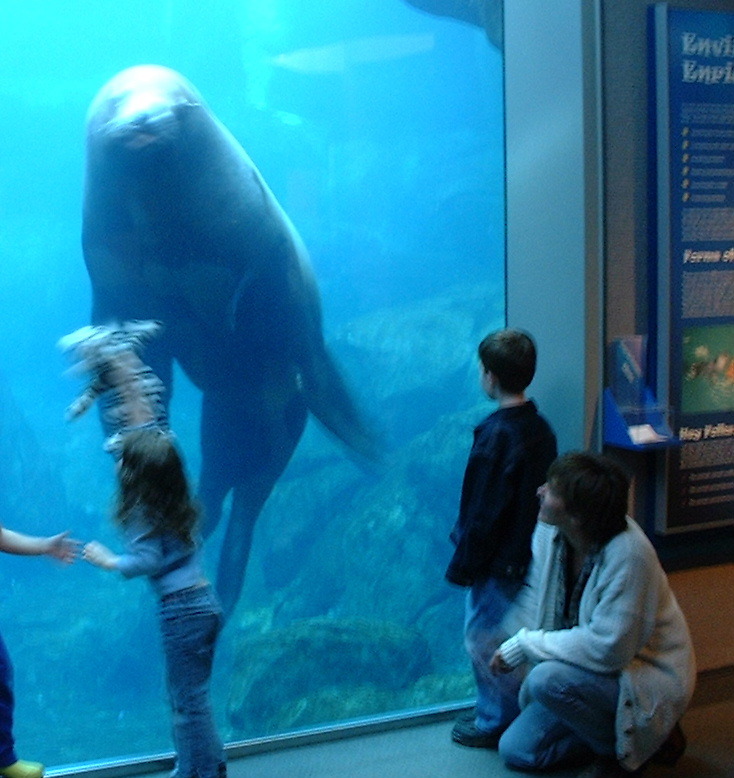 The kids loved it, especially the sea lion, that would follow stuffed animals held against the glass, to the kids' delight! Another "must" is to make the drive up to Denali NP. This stop between Denali and Anchorage is big, well maintained, and VERY photogenic! From this point, it's still a couple or three solid driving hours to Denali NP headquarters. That's where the Inns are, as well as the point where you can (hopefully) get a seat on one of the few buses that are allowed to drive into the park. You can't drive your POV into the park! You can walk in, or ride a bike, but it's a LONG way in there. This was between Denali and Fairbanks, just about where you start to doze off after a long drive....I managed to spray coffee all over the dash and windshield when I read this driving by! Had to stop and get a shot. This young lady's expected birth was another big part of our trip. That's Grampa Walton's finger that she's got hold of, and over the years, she's managed to effectively wrap me around HER fingers! Well, I've bored you folks long enough. This is just a small smattering of the photos and video we shot, but in the recent move, the DVD's and tape are in a box somewhere in one of three storage sheds.......An amazing trip, well worth it! Your friend Bob reminds me of a kid that I knew up at Malmstrom AFB. He was a monster! His feet were big enough that they didn't have or make combat boots in his size, and he carried a letter around in his wallet that authorized him to wear black "tennies" on duty. When we were finally required to wear steel toed boots, he had Redwing custom build him boots, and got another letter of authorization. He was a teetotaller when I knew him. Big enough that if he got into an altercation with anyone, he'd do some really serious damage, so he just avoided the situations altogether. 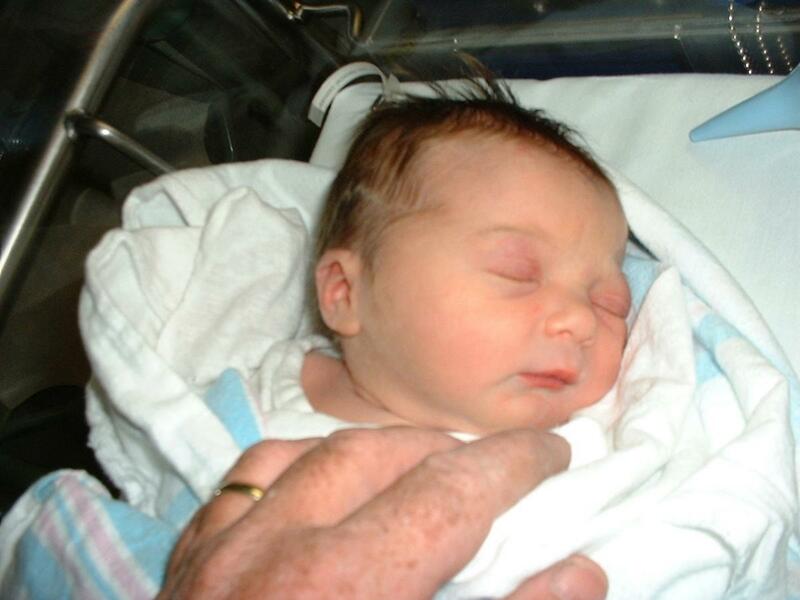 We came in from dispatch late one night, and he was preparing the load for a truck that was dispatching the next morning. He was at the far end of the hangar, walking toward us, whistling, and carrying something under each arm. When he passed us on his way, he had a full nitrogen bottle under each arm, and hadn't even broken a sweat. We named him "Tiny". 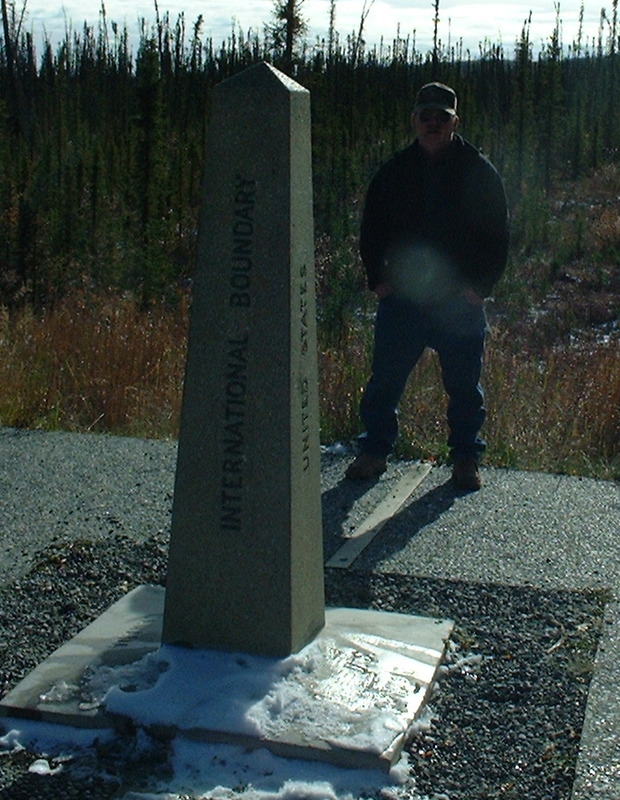 Fantastic photos from Alaska Highway, Rocket Doctor! Thanks for posting, brought back places and names. 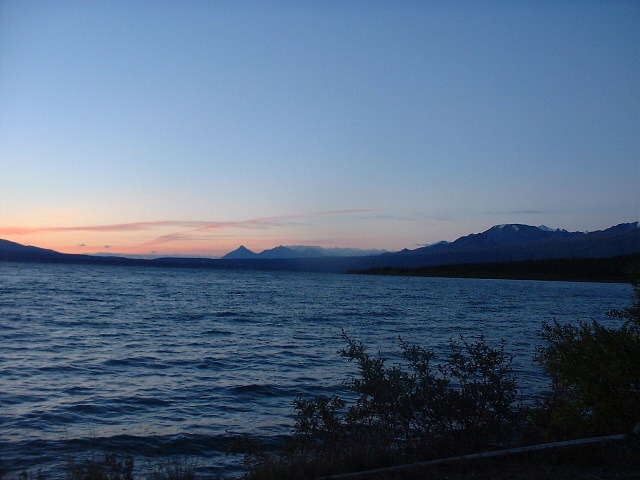 Kluane Lake was very interesting, a recollection to this day. Lots of rock and gravel around the lake, crystalline clear water...icy cold as I recall. Tiny and the bottles under each arm remind me of Bob's truck and tractor repair business and a 427 tall-deck GM medium duty truck short block (block with fitted crankshaft still in place) that we took to Harold Long's Machine Shop at Carson City. The crew there was fussing about how to hoist or forklift the iron monster from Bob's pickup bed, and Bob got impatient. He grabbed the short block under the "V" ledges and lifted it from the bed to the floor. Their jaws dropped, and the story circulated around town for some time. Bob and I had only an old Scotsman travel trailer on the Alcan, 14' as I recall, it towed well, basically a bunkhouse. We survived!